Having missed the previous week's draw away to Ashington (a 1-1 draw snatched by the Colliers in added time as well as a Robinson sending off) I was expecting great things from the Bay today. However for my first home game since herniagate, me and the Boy Mark would be joined by my faithful folding chair so that I could watch the game from my usual vantage spot in the newish stand rather than sitting in the cramped main seated stand with its pillar-obscured view. Despite the lack of Premiership and Championship football, because of the international matches, there didn't seem to be that many fans in the ground so I was able to set up camp near my usual spot. There was only time for a quick scan of the teamsheet before the game kicked off and the first time I looked up the ball rolled into Whitley's net. "This is going to be a long afternoon." promised the bloke in the flat cap next to us and indeed it was. Shildon ran the show but on the occasions that they managed to get possession, Whitley showed glimpses of good play and came close on a couple of occasions. The referee bottled a potential sending off after one of the visitors kicked out at Robo, an incident that was spotted by the linesman but still went unpunished. Disaster struck next as the referee's watch stopped and once again I looked up from checking the time to see Shildon celebrating their second goal. 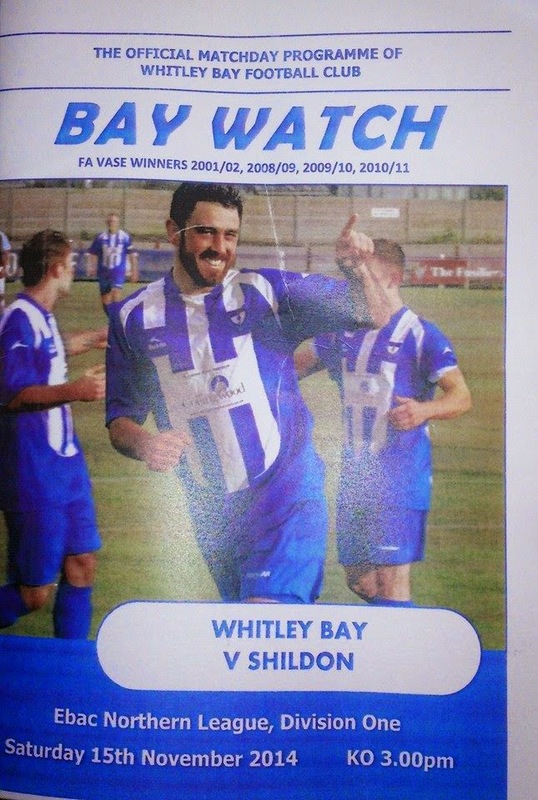 The second the game was restarted by Whitley the half time whistle was blown...strange timing that. A hobble around to our usual second half spot meant I could lean on the barrier. Maybe there would be a change of luck yet there would be no difference as Whitley struggled to make any meaningful efforts: ex-Whitley keeper Kyle Hayes, in the Shildon goal, becoming a virtual spectator for long periods of the game. The Bellend Choir behind his goal watched silently, deprived of even the occasional tingle of its famous bell: sadly missing today. "Turn him...man on yer back....don't let him... (he didn't)...go to him...get rid..."
She then added her own variations on the players' names and this reached a peak when Lee Chapman (not the Lee Chapman) was introduced to the field of play "come on Chapper...Chaps....Chappsie..." This got worse when the third Shildon goal sped past Gladstone in the Whitley goal and her cries were joined by another visiting fan in the main stand who constantly cried out in a long and drawn out manner: "C'mon on Shildon". I once again failed to spot their fourth and fifth goals going in and it was a subdued crowd that left Hillheads. Tears on the way home. With Robinson suspended for the following week's FA Vase the chances of our season's excitement ending in the next week looked a distinct possibility. The boy Mark even mentioned the R word: surely we weren't that bad were we? The prospect of watching the England v Slovenia match improved my mood slightly...until it started and then it became re-run of Whitley's performance and the fact that Strictly Come Dancing would follow after it made matters worse. Would things have been better if I had worn odd shoes again? Or if Mark hadn't forgotten his hat? Who knows? The responsibilities of a football fan were all too apparent!